Please feel free to contact me on scientific questions related to the models and source code, or for bug reports. I will try anwering to those requests and remarks as soon as possible. However, before contacting me, please do read the articles describing the models carefully, look at the comments in the source code explaining some typos in the articles and hence parameter differences between article and source code and look at the FAQ section first. Furthermore, please note that I can not answer requests for help with programming problems. C++ source code for the first version of our human ventricular cell model. 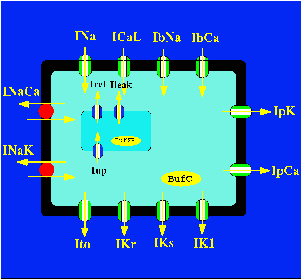 The model is based on human based experimental data for the individual ionic currents (INa, Ito, IKr, IKs, IK1, ICaL), action potential shape, duration, restitution, and ionic concentration changes. 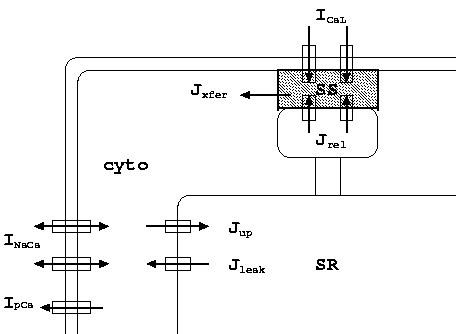 A Java applet of the human ventricular cell model. The applet was developed by Flavio Fenton and Elizabeth Cherry from Hofstra University .